WARNING: The North Caucasus is a volatile, unpredictable region. While not the war zone it once was, organized crime, separatist activity and government counter-action against suspected radical Muslims continue. Read about the current situation before traveling south, especially to Dagestan, Chechnya and Ingushetia. The North Caucasus is a region of the Caucasus located in Southern Russia, bordering Georgia to the south and Krasnodar Krai, Stavropol Krai, and Kalmykia to the north. Unfortunately, while this should be one of the world's most exotic and thrilling destinations, it is currently very dangerous and inadvisable to visit due to extremely high levels of corruption and criminal and political violence. Potential visitors should consider getting a taste of the North Caucasus in a safer area, such as Northern Georgia, Northern Azerbaijan or in the south of Krasnodar Krai around Sochi and Krasnaya Polyana. These regions are primilarily home to rather poor Muslim territories. Also, North Caucasus is home to Russia's most lawless regions. A gorgeous and fascinating region that has been ravaged by the past two decades of conflict, the most recent episode of its centuries old conflict with Russian power. Chechnya should be struck from everyone's travel list until the security situation improves, with the exception of downtown Grozny. The people are Chechens, a Caucasian Muslim ethnic group. An environment utterly exotic and alien to Russians of the steppe and woodlands, Dagestan boasts astounding cultural diversity, breathtaking and austere mountaintop villages, an ancient history, and a distinct possibility of being kidnapped, as well as a constant threat of terrorism by Chechen rebels. Home of the Ingush people, who are closely related to their Chechen neighbors. One of Russia's poorest regions, it has been mired in a low-scale civil war since 2007. Home to Europe's three tallest mountains, this region is mainly inhabited by two Muslim ethnic groups: the Kabardians, a people of Circassian ethnicity, and the Balkars, who are Turkic. Much like its neighbors, it has been affected by widespread violence and lawlessness. Most famous for its beautiful mountain resort, Dombai; it is home to the Karachay, a Sunni Muslim Turkic people. Currently, it is the safest region in the North Caucasus. Home of the Ossetes, and one of the few Orthodox Christian mountain tribes of the Northern Caucasus. Like the rest of the North Caucasus, it has been subject to significant violence and a high crime rate. Grozny — war-torn ruined city. It has since been totally rebuilt and if you had never known the history of the 2 wars here you would think this was another great Russian city to visit. Beslan A must-visit city 30 minutes drive north of Vladikavkaz. One must visit the school of the horrendous terrorist attack in 2004 that claimed hundreds of innocent lives. The Northern Caucasus is one of Russia's most beautiful regions and is most certainly its most mountainous. Its peaks are Europe's and Russia's highest. In the west, near the Black Sea, the climate is subtropical, while the eastern areas near the Caspian Sea are more arid. The most beautiful natural images of this region are of its rushing mountain rivers running through deep gorges. There are also man-made monuments left behind by the mountain people of the region, particularly their fortress-like stone "auls" (mountaintop villages), as well as by former kingdoms such as Alania, Albania, and most famously the Sassanid Empire's ancient fortress at Derbent. While there are many autonomous-ethnic regions throughout Russia, ethnic Russians outnumber the namesake ethnicity in nearly all of them. But the Northern Caucasus proves the exception: travelers to the republics of the Northern Caucasus visit wholly different nations, albeit ones strongly influenced by Russia. In addition to being the only region of Russia in which non-Russian minorities constitute a majority, the Northern Caucasus has been Russia's most rebellious and unstable region since the beginning of the Russian conquest at the start of the 19th century. As result of this long conflict, the ethnic makeup of the region has changed dramatically. The western half of the region has largely been emptied of its former inhabitants, the Turkic people of the Crimean Khanate and the "Circassian" Adyghe, and is consequently more Russified and generally safer to visit. The eastern Caucasus nationalities were mostly deported en masse to Kazakhstan following WWII, when Stalin denounced them as Nazi collaborators. This massive deportation was brutal and large proportions of these ethnicities died from hunger and lack of shelter. Under Malenkov and Khrushchev, however, they were allowed to return to their ancestral lands and have lived side by side with their Slavic compatriots for many years. The current conflict in the Northern Caucasus is complex and any potential travelers should be aware of its fault lines. The conflict began near the fall of the Soviet Union when Chechnya, a region of the Russian ASSR, declared its independence from Russia and Russia responded with a military invasion. Russia's first attack was largely unsuccessful, but was followed by a second invasion under President Putin following a Chechen invasion of neighboring Ingushetia and a series of terror attacks allegedly carried out by Chechen terrorists. The second war, although this time successful, was particularly brutal, with the Russian military attacking population centers and the Chechen rebels resorting to guerrilla warfare and terroristic attacks against Russian civilians in the Northern Caucasus and further afield in Russia. As throughout the history of the conflict between Russia and the people of the Northern Caucasus, members of other ethnic groups have joined the Chechen rebels under the umbrella of a proclaimed "jihad," in particular, the Ingush, and certain mountain groups in Dagestan. Large scale war has ceased in recent years and most high-ranking rebels, warlords and terrorists have been killed, but small-scale conflict and widespread corruption continue to plague most of the region. In addition to the anti-Russian axis of the conflict, there is also an intertwined Ossete-Ingush conflict: see Ingushetia for more background. This mountainous region is an extraordinary patchwork of peoples and languages (Circassian, Turkic, Chechen, Avar, Lezgin and a whole host of smaller groups unrelated to any other)—the relatively small region contains an incredible 8 language families and 46 different languages (35 in Dagestan alone)! Fortunately for the traveler, Russian serves as the region's lingua franca and is spoken by nearly everyone, even by villagers in remote mountain auls. The main portal cities to the Northern Caucasus are Stavropol and closer Mineralnye Vody in Stavropol Krai, Sochi in Krasnodar Krai, Vladikavkaz in North Ossetia, and Makhachkala in Dagestan. Pelmeni, khachapuri, and blinis are really popular and are regarded as delicacies. Heavy military activity, terrorist bombings, kidnappings, and unexploded mines and munitions are widespread. Throughout the region, local criminal gangs routinely kidnap foreigners, including Americans, Canadians, and UK nationals, for ransom. Close contacts with the local population do not guarantee safety. Sadly, the authorities may pose an even greater threat to travelers than rebels, bandits, and gangs. A traveller should also remember all of the region is part of the turf of the infamous terrorist group, the Caucasus Emirate, therefore adding on a greater fear. In the event of emergencies embassies can do very little, and/or more likely, will not send any help. All governments assume they will not be able to do anything for their citizens except to deliver messages. Chechnya is probably one of Russia's most volatile regions, even though the Chechen government has been making some progress in bringing stability to the nation. Violence, terrorism and a high homicide rate continue to plague the nation. As a general rule of thumb, the farther you are from Chechnya, the safer your travel experience will be. Downtown Grozny is fairly safe, but you do need to be careful as large parts of the nation are plagued with violence and political turmoil. Many foreign governments, including the UK, Canadian and US governments, strongly warn their citizens not to travel to Chechnya under any circumstances. They report that there have been many incidents of their citizens as well as Russian citizens going missing or being killed or kidnapped for ransom in Chechnya. At present, Ingushetia is the most dangerous region. Political unrest, civil disorders, and heavy military activity best describes current conditions. A civil war is taking place, and travels should be put on hold until the situation drastically improves. The authorities commit the most civil disorders, adding on a greater fear. The largest of the Northern Caucasian republics, Dagestan contains dozens of languages and ethnic groups. While the majority of the province is quiet, there are ongoing disturbances in cities like Kizlyar, Kizilyurt and the capital Makhachkala. The northern part of the province is safer, although there is a small stream of tourists to the large citadel at Derbent. Like South Ossetia, the northern part is fairly unsafe, though not as unsafe as its southern counterpart. There have been high-profile crimes, albeit infrequently. The capital Vladikavkaz has recently been the site of some showdowns between law enforcement and separatists, though on a very light scale. 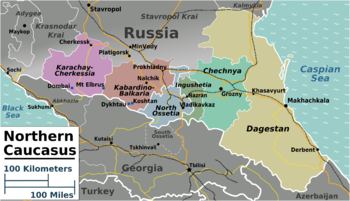 Karachay-Cherkessia is safer than most regions; however, the region has continued to see minor attacks. The republic's mainly Muslim population has become increasingly radicalised by the region's instability. The region is quite safe, though the security of the country may be occasionally shaken, due to frequent attacks by militants. Nalchik in particular is seeing a very unstable situation. The North Caucasus are largely Sunni Islamic societies (with elements of Sufi Islam). Alcohol and smoking are avoided among the devout, and many locals avoid pork and fast during Ramadan. The region has a long history of conflict with Russia. Depending on your hosts, this can be a dicey topic of conversation. Be careful when talking about the two Chechen wars, Ramzan Kadyrov, the Putin government, the forced resettlement of the Circassians and the region's ties to global Islamic extremism. That said there is a strong tradition of hospitality in the area, so don't be surprised at invitations to dinner or long conversations with new friends. Borders in and out of the region – domestic and international – have largely been reopened after years of conflict. The main highway between Derbent and Rostov-on-Don is open, and with the exception of the occasional police officer looking for a bribe, relatively easy to travel. Another way of crossing the Greater Caucasus is the Transcaucasian Highway that connects North Ossetia to South Ossetia through the famous Roki Tunnel, one of the biggest tunnels constructed in USSR. Unfortunately, this road will not bring you far, because the border between South Ossetia and Georgia is closed for political reasons, so you simply get stuck there and eventually return to North Ossetia. Flights leave from many of the subregional capital cities to Moscow, otherwise, it is easiest to leave as you come in: via Sochi or Stavropol/Mineralnye Vody. From Sochi, you can also travel to Abkhazia along the sea coast. Crossing the Abkhazian border from Kabardino-Balkaria directly through the mountains is not possible and will be physically quite difficult anyway. This page was last edited on 25 May 2017, at 05:03.